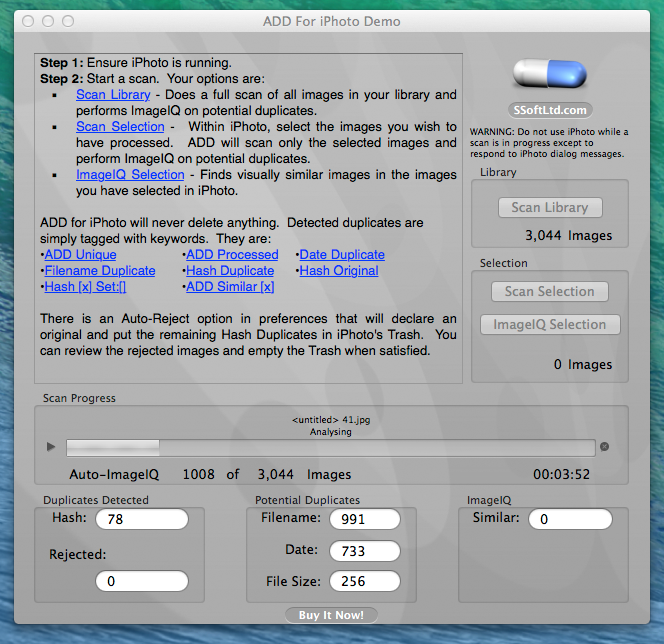 Do you use iPhoto on your mac for your photos and images? Do you have duplicate images sitting in your library? Enter ADD For iPhoto. It is designed to work with iPhoto '11 and will scan your library for duplicates that have accumulated over time and waste hard drive space. There is also a tutorial on what to do once ADD for iPhoto has finished its job. Your photographs are precious, important, and valuable. This is why ADD won't delete anything without your consent. ADD does not know which is the original you want to keep. There are many reasons for this. Duplicates may be coming from different events.... have different ratings.... different comments.... and so on. ADD does not want to make a decision about which one you want to keep as it would almost always be wrong for one person or another. That being said... there is an advanced option that will allow ADD to declare an original and move the rest to the trash. This is disabled by default because of the risk of making the wrong decision as to what should be kept. If you are interested in this sort of automation and don't care about which of the duplicates is deleted have a look at this this tutorial. Visit the ADD For iPhoto Support Page. V3.4.5.1 Bug fixes. Removes restrictions on Aperture version for demo mode. V3.4.1 New selection scan mode to compare selected images against entire library. Enhanced tooltips and help. Various bug fixes. V3.2.4 Various optimizations to improve scan peformance and find more potential duplicates. Bug fixes related only to demo mode. Relaxes some restrictions on demo mode to find more duplicates. Adds a crash reporter subsystem. V3.2.3 Bug fixes to improve stability on loading data from iPhoto. Auto-Reject now only applied "Hash Original" keyword to the declared original. Updated application icon set. iPhoto 9.4.3 tested. V3.2.1 Bug fix for situation where keywords might not be applied to duplicates. Bug fix for auto import of keywords which was missing the "Hash Original" keyword. Other minor features included. V3.1.2 Demo mode now allows a full library scan to be initiated. Minor UI tweaks on alert dialogs. Bug fixes. V3.1.1 Keywords automatically generated. You no longer have to enter them manually. V3.0.4 In app help greatly expanded. More tooltips in preferences. Bug fixes. Time during loading stage displayed as local time. Improved ImageIQ processing which handles 90 degree rotations as similar. Progress is shown during loading stage. Ability to cancel scan even while loading data. ADD will no longer allow a scan to start until the required keywords are correctly entered. V3.0.3 Bug fixes and stability enhancements to loading library phase. iPhoto 9.4.2 tested. V3.0.1 This release contains significant new features for ease of use including an automatic hash mode, run time duplicate statistics, selection free scanning, and more.